Didn’t like it then, now I do. It’s magic! If you read my reviews regularly, you’ll probably know how much I love The Dresden Files, but that I initially didn’t like it very much, to the point where I gave up after reading book three way back in 2009. I just didn’t think the series was for me. That I thought that at the time is alternately hilarious and horrifying. I almost didn’t pick this series back up, and so I almost missed out on what has turned out to be more and more of a favorite series as it goes on. So I’ve been meaning to revisit these first three books for quite a while now, because I knew I would like them more if I gave them another go, knowing what I know now about the characters and the world, and how much Butcher’s writing has improved on all fronts. Also, I really really wanted to listen to the audio versions of the first three books, since I read the paperbacks the first time through, and James Marsters is life. Anyway, just as I expected, I liked this so much better this time around. But what’s really weird about this re-read is that I was able to pinpoint exactly why past Ashley felt weird about this book and didn’t really like it very much, even though I wasn’t really able to do that at the time. It’s still very weak in comparison to every book in the series excepting #2, Fool Moon, which I remember being my least favorite, but my mindset is so different this time around, it was like I was reading an entirely different book. But also, the same book. Because it’s the same book. You know what never mind, you know what I mean. The biggest difference for me this time was that I no longer felt emotionally distant from Harry or the other characters, so I automatically cared more about what was happening, and I was much more willing to forgive Harry and his idiotic flaws, which really rankled me the first time through. He really is very sexist in these early installments, although benignly so (as benign as sexism can get, anyway–he calls it being “old-fashioned”). He’s also way too mistrusting of his allies, and if I didn’t already have a substantial emotional attachment to the big idiot, I would be bored and frustrated with his seeming inability to connect to other people. It’s not good if your story has a main character who won’t actually form relationships and have significant interactions with your other characters. At the same time, in hindsight, it’s clear that Butcher at least had a rough idea of where his story was going from the beginning. 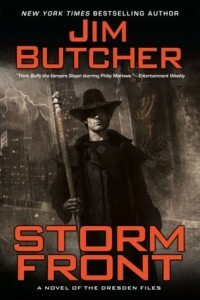 So many of the pieces that will come to be important are set up here (or, alternatively, he’s just really good at taking a base and building on it, but I tend to believe the former theory, given how Butcher has shown his love for setting things up way in advance). Anyway, re-reading this has only solidified my feelings about this series, so I guess that means I will never shut up about it, and every time someone gives up before reading at least book four, I will have to hound them mercilessly until they repent. Share the post "Didn’t like it then, now I do. It’s magic!" I am 90% done with Fool Moon, and I keep telling myself that these will get better. I really like the idea and characters, but the plot in FM is all over the place and driving me bonkers. But bless James Marsters, he is a narrating god amongst men. You’re sooooo close to the good stuff. Just keep going!